I love to treasure traditional recipes and this is one of my favorite. Ragi simili is a good source of calcium and an excellent source of iron. Those suffering from anemia and low hemoglobin levels can take 2-3 ragi simili balls everyday as it might help improve the condition. It also helps to boost lactation. 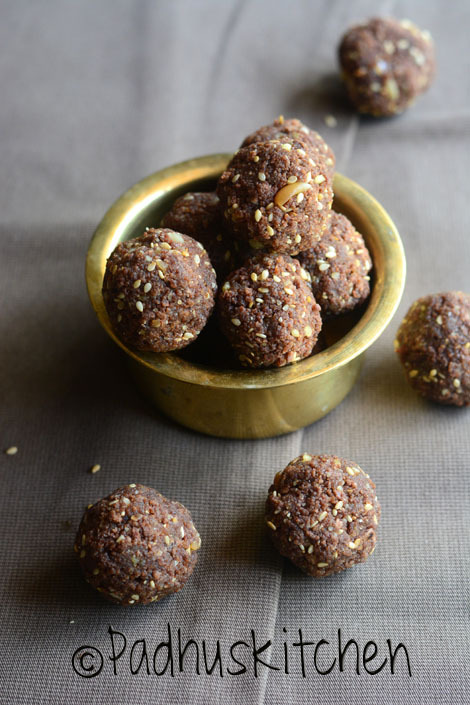 Today we will learn how to make ragi laddu or ragi peanut simili following this easy recipe with step wise pictures. Roast peanuts until light brown. Leave it to cool. Then rub the skin and puff it off. Keep the peanuts aside. Dry roast sesame seeds until it splutters. Leave it to cool. Dry roast ragi flour on low heat stirring continuously until you get an aroma of roasted flour. Add salt and hot water (not boiling water) to the ragi flour little at a time and make a soft dough. Divide the dough into 3 or 4 equal parts and make balls out of it. Grease a tawa with oil, place a ragi ball on it. Wet your hands and flatten the ball to a thin roti and switch on the heat. Apply oil or ghee on the surface and cook both sides on low heat. Once cooked remove from tawa and leave it to cool. Repeat the same process for the other balls. Now tear the cooked ragi roti roughly into small pieces. Grind ragi roti bits in a mixie. Then add the roasted peanuts and grind until it gets blended well with the ragi. Then add powdered jaggery (use clean jaggery- I used organic jaggery powder) and blend everything together. Add roasted sesame seeds and blend just for 2-3 seconds. Remove the mixture on a plate and make balls out of the mixture and enjoy. I kept aside some roasted sesame seeds and rolled the ball on it. Note - If you want fine balls, powder the peanuts separately and ragi adai separately and then grind both together. Shelf life and Storage - Store it in an airtight container. Stays good for 5-6 days in the refrigerator. Going to try this.. Thanks Padhu..looks healthy n delicious!! Thank you for sharing Padhu. All your posts are very useful. I always refer your recipes to learn anything new.